Tomasetti, C., Marchionni, L., Nowak, M. A., Parmigiani, G. & Vogelstein, B. Only three driver gene mutations are required for the development of lung and colorectal cancers. Proc Natl Acad Sci USA 112, 118–123 (2015). Zhang, X. & Simon, R. Estimating the number of rate limiting genomic changes for human breast cancer. Breast Cancer Res Treat 91, 121–124 (2005). Luebeck, E. G. & Moolgavkar, S. H. Multistage carcinogenesis and the incidence of colorectal cancer. Proc Natl Acad Sci USA 99, 15095–15100 (2002). Little, M. & Wright, E. A stochastic carcinogenesis model incorporating genomic instability fitted to colon cancer data. Mathematical biosciences 183, 111–134 (2003). Ashley, D. The two “hit” and multiple “hit” theories of carcinogenesis. Br J Cancer 23, 313 (1969). Armitage, P. & Doll, R. The age distribution of cancer and a multi-stage theory of carcinogenesis. Br J Cancer 8, 1 (1954). Nordling, C. A new theory on the cancer-inducing mechanism. Br J Cancer 7, 68 (1953). Anandakrishnan, R. Estimating the number of genetic mutations (hits) required for carcinogenesis based on the distribution of somatic mutations. PLOS Comp Bio In Review (2018). Tian, R., Basu, M. & Capriotti, E. Contrastrank: a new method for ranking putative cancer driver genes and classification of tumor samples. Bioinformatics 30, 572–578 (2014). Tamborero, D., Gonzalez-Perez, A. & Lopez-Bigas, N. Oncodriveclust: exploiting the positional clustering of somatic mutations to identify cancer genes. Bioinformatics 29, 2238–2242 (2013). Dees, N. D. et al. Music: identifying mutational significance in cancer genomes. Genome Res 22, 1589–1598 (2012). Kumar, R. D., Swamidass, S. J. & Bose, R. Unsupervised detection of cancer driver mutations with parsimony-guided learning. Nat Genet 48, 1288–1294 (2016). Kuchenbaecker, K. B. et al. Risks of breast, ovarian, and contralateral breast cancer for BRCA1 and BRCA2 mutation carriers. JAMA 317, 2402–2416 (2017). Mai, P. et al. Li-Fraumeni syndrome: report of a clinical research workshop and creation of a research consortium. Cancer Genet 205, 479–87 (2012). Pantziarka, P. Primed for cancer: Li Fraumeni Syndrome and the pre-cancerous niche. Ecancermedicalscience 9, 541 (2015). Guha, T. & Malkin, D. Inherited TP53 mutations and the Li-Fraumeni syndrome. Cold Spring Harb Perspect Med 7, a026187 (2017). Amadou, A., Waddington Achatz, M. & Hainaut, P. Revisiting tumor patterns and penetrance in germline TP53 mutation carriers: temporal phases of Li-Fraumeni syndrome. Curr Opin Oncol 30, 23–29 (2018). Grant, R. C. et al. Prevalence of germline mutations in cancer predisposition genes in patients with pancreatic cancer. Gastroenterology 148, 556–564 (2015). Kinzler, K. W. & Vogelstein, B. Lessons from hereditary colorectal cancer. Cell 87, 159–170 (1996). Stahl, M. et al. Epigenetics in Cancer: A hematological perspective. PLoS Genet 12, e1006193 (2016). Schneider G, R. R. S. D. & Schmidt-Supprian, M. Tissue-specific tumorigenesis: context matters. Nat Rev Cancer 17, 239–53 (2017). Almassalha, L. et al. The greater genomic landscape: The heterogeneous rvolution of cancer. Cancer Res 76, 5605–9 (2016). Vogelstein, B. et al. Cancer genome landscapes. Science 339, 1546–58 (2013). Chvatal, V. A greedy heuristic for the set-covering problem. Mathematics of Operations Research 4, 233–235 (1979). Feige, U. A threshold of ln n for approximating set cover. Journal of the ACM (JACM) 45, 634–652 (1998). Al-Lazikani, B., Banerji, U. & Workman, P. Combinatorial drug therapy for cancer in the post-genomic era. Nature biotechnology 30, 679 (2012). Ledford, H. Cocktails for cancer with a measure of immunotherapy. Nature 532, 162–164 (2016). Pleasance, E. et al. A comprehensive catalogue of somatic mutations from a human cancer genome. Nature 463, 191–196 (2010). Xi, J., Wang, M. & Li, A. Discovering mutated driver genes through a robust and sparse co-regularized matrix factorization framework with prior information from mRNA expression patterns and interaction network. BMC Bioinformatics 19, 1–14 (2018). Spencer, D. H. et al. Performance of common analysis methods for detecting low-frequency single nucleotide variants in targeted next-generation sequence data. J Mol Diag 16, 75–88 (2014). Sandmann, S. et al. Evaluating variant calling tools for non-matched next-generation sequencing data. Sci Rep 7, 43169 (2017). Pearson, K. Mathematical contributions to the theory of evolution. iii. regression, heredity, and panmixia. Philosophical Transactions of the Royal Society of London. Series A, containing papers of a mathematical or physical character 187, 253–318 (1896). Liu, X. & Ling, Z.-Q. Role of isocitrate dehydrogenase 1/2 (IDH 1/2) gene mutations in human tumors. Histology and Histopathology 30, 1155–1160 (2015). Merid, S. K., Goranskaya, D. & Alexeyenko, A. Distinguishing between driver and passenger mutations in individual cancer genomes by network enrichment analysis. BMC Bioinformatics 14, 308 (2014). Berger, A. et al. High-throughput phenotyping of lung cancer somatic mutations. Cancer Cell 30, 214–228 (2016). Leiserson, M. D., Reyna, M. A. & Raphael, B. J. A weighted exact test for mutually exclusive mutations in cancer. Bioinformatics 32, 736–745 (2016). Parrales, A. & Iwakuma, T. Targeting oncogenic mutant p53 for cancer therapy. Front Oncol 5, 288 (2015). Pan, B., Zheng, S., Liu, C. & Xu, Y. Suppression of IGHG1 gene expression by siRNA leads to growth inhibition and apoptosis induction in human prostate cancer cell. Mol Biol Rep 40, 27–33 (2013). Xu, Y. et al. IgG silencing induces apoptosis and suppresses proliferation, migration and invasion in LNCaP prostate cancer cells. Cell Mol Biol Lett 21, 27 (2016). Weinstein, J. et al. 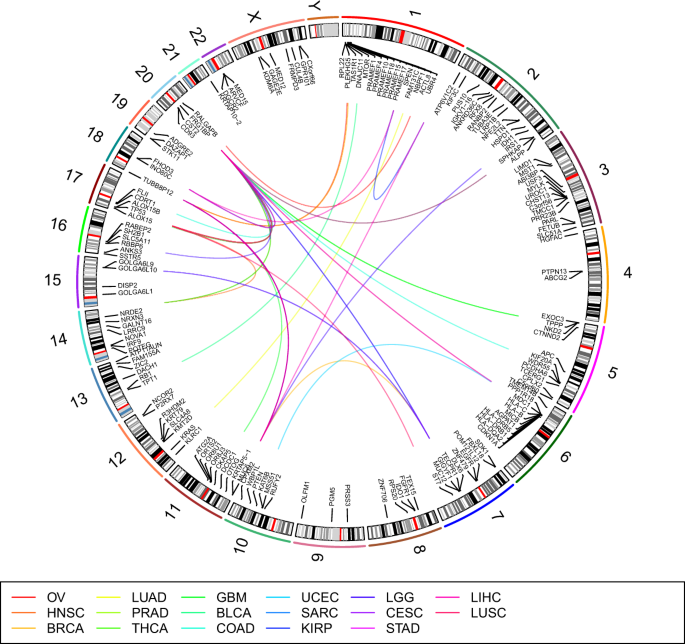 The cancer genome atlas pan-cancer analysis project. Nat Genet 48, 1288–1294 (2016). Copson, E. R. et al. Germline BRCA mutation and outcome in young-onset breast cancer (POSH): a prospective cohort study. Lancet Oncol 19, 169–180 (2018). Berchuck, A. et al. Frequency of germline and somatic BRCA1 mutations in ovarian cancer. Clin Cancer Res 4, 2433–2437 (1998). Zhang, H., Meltzer, P. & Davis, S. Rcircos: an R package for Circos 2D track plots. BMC Bioinformatics 14, 244 (2013). Cerami, E. et al. The cbio cancer genomics portal: An open platform for exploring multidimensional cancer genomics data. Cancer Discovery 2, 401–404 (2012). Gao, J. et al. Integrative analysis of complex cancer genomics and clinical profiles using the cbioportal. Sci. Signal. 6, pl1–pl1 (2013). Song, Y. & C.J., Z. Effect of hydralazine on demethylation status and expression of APCgene, proliferation and apoptosis of human cervical cancer cell lines. Chinese journal of pathology 36, 614–8 (2007). Wang, T. et al. Increased nucleotide polymorphic changes in the 5′-untranslated region of δ-catenin (CTNND2) gene in prostate cancer. Oncogene 28, 555–564 (2009). Dhillon, S. Ivosidenib: First global approval. Drugs 78, 1509–1516 (2018). Liu, X., Jakubowski, M. & Hunt, J. KRAS gene mutation in colorectal cancer is correlated with increased proliferation and spontaneous apoptosis. Am J Clin Pathol 135, 245–52 (2011). Matsuyama, T. et al. MUC12 mRNA expression is an independent marker of prognosis in stage II and stage III colorectal cancer. Int J Cancer 127, 2292–9 (2010). Vincent, A. et al. Epigenetic regulation (DNA methylation, histone modifications) of the 11p15 mucin genes (MUC2, MUC5AC, MUC5B, MUC6) in epithelial cancer cells. Oncogene 26, 6566–76 (2007). Yim, E. et al. Rak functions as a tumor suppressor by regulating PTEN protein stability and function. Cancer Cell 15, 304–14 (2009). Arima, Y. et al. Rb depletion results in deregulation of E-cadherin and induction of cellular phenotypic changes that are characteristic of the epithelial-to-mesenchymal transition. Cancer Res 68, 5104–12 (2008). Vannini, I. et al. Role of p53 codon 72 arginine allele in cell survival in vitro and in the clinical outcome of patients with advanced breast cancer. Tumour Biol 29, 145–51 (2008). Ma, J. et al. 15-lipoxygenase-1/15-hydroxyeicosatetraenoic acid promotes hepatocellular cancer cells growth through protein kinase b and heat shock protein 90 complex activation. Int J Biochem Cell Biol 45, 1031–41 (2013). Ben-Arie, A., Hagay, Z., Ben-Hur, H., Open, M. & Dgani, R. Elevated serum alkaline phosphatase may enable early diagnosis of ovarian cancer. Eur J Obstet Gynecol Reprod Biol 86, 69–71 (1999). Natrajan, R. et al. Amplification and overexpression of CACNA1E correlates with relapse in favorable histology Wilms’ tumors. Clin Cancer Res 12, 7284–93 (2006). Ritterhouse, L. L. et al. Ros1 rearrangement in thyroid cancer. Thyroid 26, 1 (2016). Tan, E., Richard, C., Zhang, H., Hoskin, D. & Blay, J. Adenosine downregulates DPPIV on HT-29 colon cancer cells by stimulating protein tyrosine phosphatase(s) and reducing ERK1/2 activity via a novel pathway. Am J Physiol Cell Physiol 291, 433–44 (2006). Paul, N. et al. α5β1 integrin recycling promotes Arp2/3-independent cancer cell invasion via the formin FHOD3. J Cell Biol 210, 1013–31 (2015). An, Q. et al. Heterogeneous breakpoints in patients with acute lymphoblastic leukemia and the dic(9; 20)(p11-13; q11) show recurrent involvement of genes at 20q11.21. Haematologica 94, 1164–9 (2009). Verheyden, S. et al. Role of the inhibitory KIR ligand HLA-Bw4 and HLA-C expression levels in the recognition of leukemic cells by natural killer cells. Cancer Immunol Immunother 58, 855–65 (2009). Mundhada, S., Luthra, R. & Cano, P. Association of HLA class i and class ii genes with bcr-abl transcripts in leukemia patients with t(9; 22) (q34; q11). BMC Cancer 4, 25 (2004). Fleming, J., Ginsburg, E., Oliver, S., Goldsmith, P. & Vonderhaar, B. Hornerin, an s100 family protein, is functional in breast cells and aberrantly expressed in breast cancer. BMC Cancer 12, 266 (2012). Coma, M. et al. Impaired voltage-gated K+ channel expression in brain during experimental cancer cachexia. FEBS Lett 536, 45–50 (2003). Qin, Y., Tang, X. & Liu, M. Tumor-suppressor gene NBPF1 inhibits invasion and PI3K/mTOR signaling in cervical cancer cells. Oncol Res 23, 13–20 (2016). Tsai, L. et al. The sodium-dependent glucose cotransporter SLC5A11 as an autoimmune modifier gene in SLE. Tissue Antigens 71, 114–126 (2007).